I am so excited to be sharing what I have been up to since October 2016!! Every human on planet earth needs to be eating hemp oil! Our Nano-enhanced Hemp Oil is why I am so 100% aligned with PrimeMyBody! I am so blown away by the results people are experiencing physically, emotionally, mentally and spiritually….and then with our business model, financially as well. I am calling our Hemp Oil, Chiropractic in a bottle, because of how it brings the body into greater balance so that we can show up in our lives as the best version of ourselves. If you would like to learn more about this Hemp Oil or need assistance purchasing the Hemp Oil for you or a loved one, please email me or call my office for a free 10 min consultation about the Hemp Oil at 541-701-9174. PrimeMyBody’s Chief Medical Advisor Cheng Ruan, MD, explains why RECEPT is truly a revolutionary product in the hemp market. Dr Erin Pollinger walks you through PrimeMyBody, shares more on the benefits of this Hemp Oil and the powerful opportunity available to you through this product and company. Our Hemp Oil is packed full of phytocannabinoids, which feed the Endocannabinoid System (ECS). Most people do not know about this system because it is a fairly recent medical discovery, but it is proving to be the most important medical discovery of all time. This ECS is the master control system and is responsible for homeostasis, which simply means the body being in balance. When our ECS is not functioning it impacts all other systems in our body. The ECS regulates almost every aspect of our well-being. We have receptors for cannabinoids in our brain, nervous system and peripheral organs. Our bodies are supposed to be producing endocannabinoids from within, but because we are so toxic and depleted in nutrients, and are in such a state of fight or flight, we are deficient in these endocannabinoids. Because the ECS is working more efficiently now that we have taken Hemp Oil, all other systems can function better. The main systems affected are the nervous system, the endocrine system, and the immune system, which we all know need to be functioning optimally for us to experience a high level of health and wellness. Please google cannabinoids/health benefits to read more about how these cannabinoids are supporting people. What makes RECEPT Hemp Oil stand out from other brands? 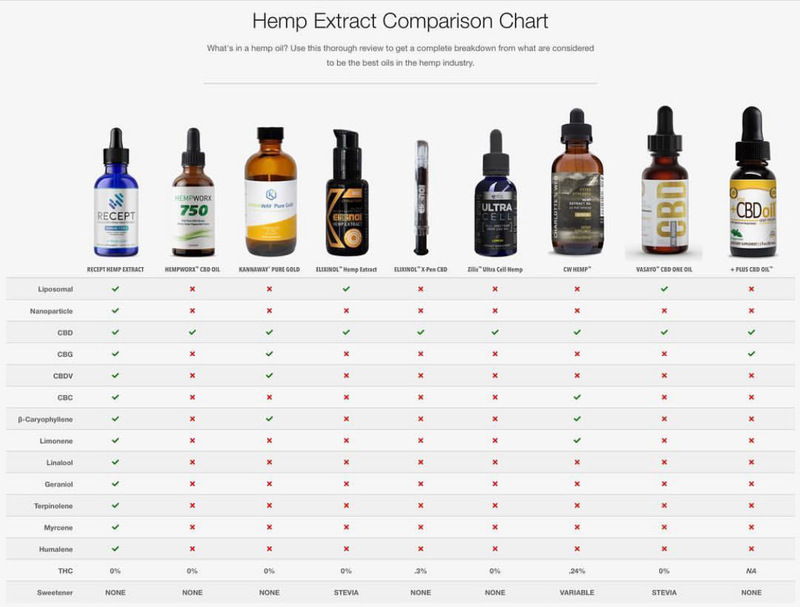 While there are many Hemp Oils out there, make no mistake that not all are created equal. What we have got is absolutely the best Hemp Oil available. ~ Our plants are grown organically in the USA, which is important because hemp can remove toxins from the soil. If you are not eating a clean hemp product, you are eating toxins. ~ High levels of CBD AND CBG. 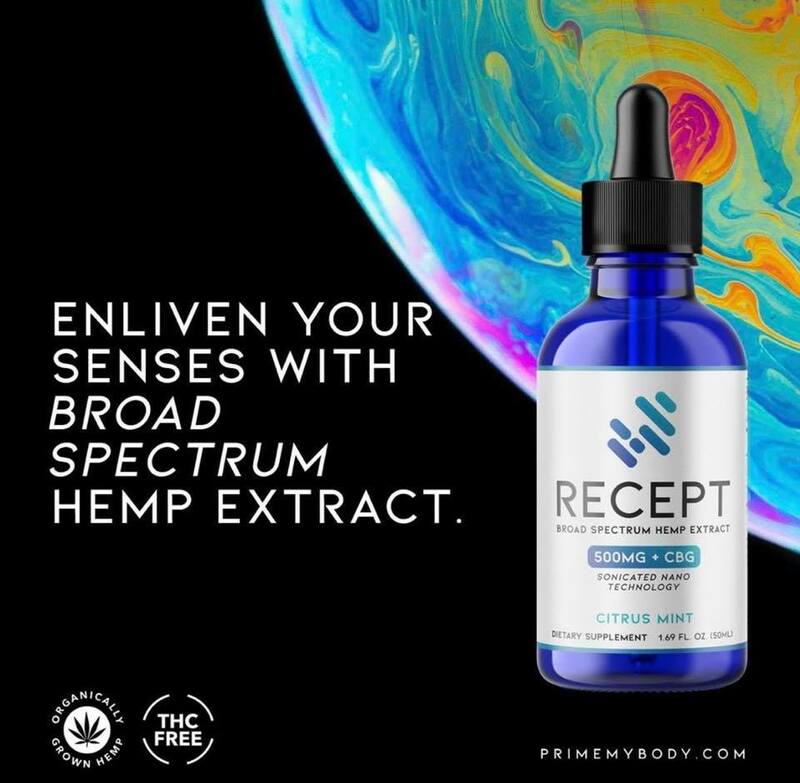 RECEPT is the first hemp extract in the world to showcase the highest levels of CBG and phytocannabinoids in it’s blend. ~ Sonicated Nano Technology. Never been used technology with CBD. Average liposome size= 20nM. ~ THC free, Ethanol free, Non GMO. ~ Broad spectrum hemp oil with 7 Terpenes. ~ Peppermint essential oil for flavoring. What’s in a Hemp Oil? See why RECEPT is truly the best on the market and has no competition. Start using this Hemp Oil Today! 1. As a customer with a one-time purchase. 2. As a customer on auto-ship. 3. As an affiliate. Signup as an affiliate. Become a PrimeMyBody Affiliate and Join The Freedom Community! Ready to experience more health and more wealth with a community of inspired individuals who are changing the world? I love the fact that we get to talk about both of these topics that I am so passionate about within the PrimeMyBody conversation. The fact that we are blasting out globally the BEST of the next booming industry that is cannabis and cannabinoids combined with the ground floor of our service and spirit affiliate marketing company, makes this one of the most exciting opportunities that I have come across. It’s such a win-win that the more money you make, the more you know the oil is getting into people’s bodies and transforming their lives. I believe that money is just energy. The more of it we have, the more we are supported by this energy to step into our fullest potential. Remember, health and wealth go hand in hand. You can’t have one without the other! Interested in the Freedom Community & sharing this revolutionary Hemp Oil? I am a Chiropractor for almost 20 years as well as a life coach supporting people around physical and financial freedom. I run a retreat center in Costa Rica, called Tierra Sagrada de Costa Rica, which is my biggest passion project right now. I teach Tantric Dance of Power and Pleasure and support women to create lives that they love through this practice. I am also an Independent Affiliate with PrimeMyBody and the top female earner and third top earner in the company. A few years ago I realized that I was playing small and wanted more. I was tired of being attached to an office or computer to make money and I knew there was a way that I could have a greater impact. So, I actively started calling something in that would allow me more freedom….freedom in my body, freedom around money, freedom to travel and spend more time with those I love, freedom to send my daughter to whatever college she wanted to go to, freedom to continue building out my retreat center, freedom to live my most passionate and exciting life AND freedom to give my gifts in a bigger way and be of greater level service to others. In October 2016, I was introduced to this incredible company and immediately knew it was what I had been praying for. I am now focusing most of my time and energy here. I am the top female earner and am playing a big role in educating, inspiring and training others to experience freedom and success as I have. *Disclaimers: We make no medical claims that our oil heals, treats or cures any disease or condition as it is a dietary supplement. We also make no claims or guarantees of income.